2. 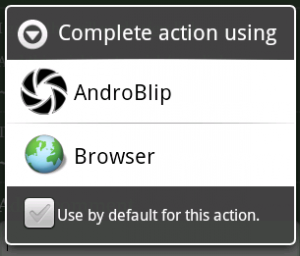 Download from the Website (apk): AndroBlip 1.2.1 (free). Check out our fancy pants ‘about’ tab in the prefs! Sometimes, especially on slower connections, loading an image can take quite a while. Up until now you would get a black screen with no feedback. Part one of “better experience” is done. You might get the non-informative black/empty screens sometimes (loading comments on slow connections I guess), but most of the time you will see that something is actually happening. The app was remembering all your visited entries. While this is extremely intuitive, certainly when using the ‘back’ button, this makes your Android memory go “whoopy”. And not in a good way. So this all boils down to: “back goes to home” in the end. More caching (entries for instance, up to 10 at this point) going on! Sadly, this means you’ll be getting the ‘question mark’ image on all of your views the first time you open the app after updates. Sorry ’bout that, but it doesn’t seem like a big killer at this point :). Just press the reload button! Hey there… loving the app as always. I have a comment regarding the Back button behaviour, as you mentioned above. I definitely agree with the new behaviour that the Back button effectively means “go home”… however, if you’re /already/ home, the Back button should exit the app. At the moment, it keeps returning you to the Androblip home which, if you have animations enabled, just shows the same page flying in from the right. That’s a good point! Just forgot to add the homepage to the list of places where the back button should not be messed with :). Will be fixed next time round!